The spectacular Hong Kong skyline with Kowloon and Hong Kong islands divided by Victoria Harbour. Some of HK’s architectural icons are the Bank of China Tower by IM Pei (left), my personal fave; IFC or International Finance Centre (in front of BOC); and HK’s tallest building, ICC or International Commerce Centre, across the harbor. Photo from HKTB. We’ve all been there — flights that have excruciatingly long stopovers on the way to our destination or coming back home. Assuming you have five solid hours in a city (excluding travel from and to the airport), where would you go, what would you do? What better way to explore than be guided by locals’ recommendations? The friends I asked for tips are taking us to a mountain peak for unparalleled views of the World’s Skyscraper Capital to the longest escalators, museums, golden temples, sky bars, restaurants, malls and quaint shop houses. For the first of the Stopover series, FindingMyWay lands in Asia. 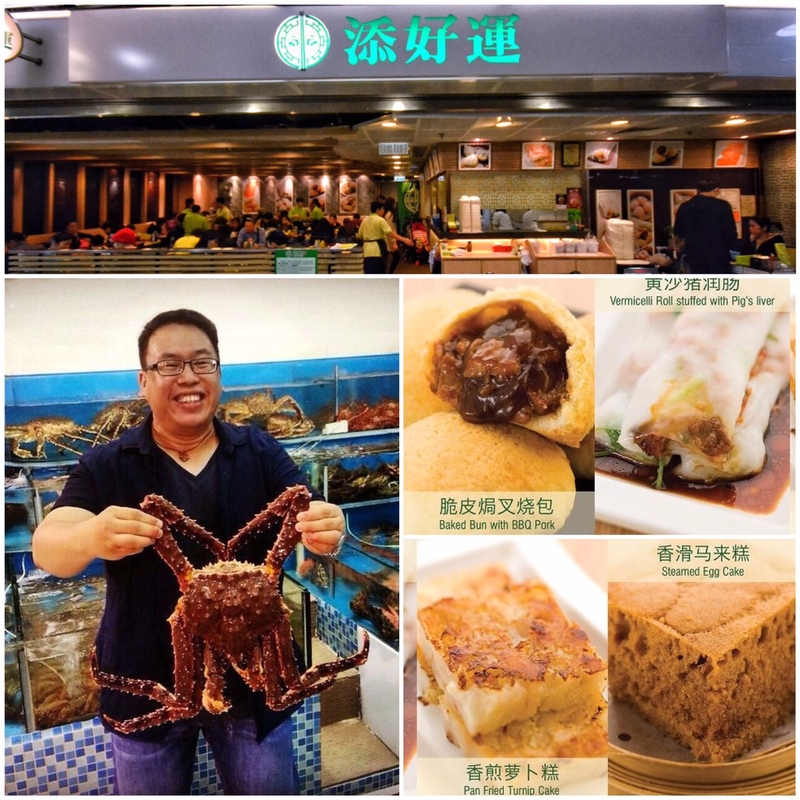 Hong Kong is written by my super friend Anthony Legaspi, head of sales for Asia of the Hilton Group, who many years ago brought me to the best hole-in-the-wall crab dinner I ever had in my entire life, at Hong Kong’s Under the Bridge. Singapore by Insight Vacations regional director for Asia Sheryl Lim, who seems to be living out of her suitcase with all the traveling she’s doing. Jakarta by Jakarta Post managing editor Primastuti Handayani, who was my classmate many years ago in Seoul, South Korea. Kuala Lumpur by Malaysian Star lifestyle editor Vicky Ooi, who was my roommate on a fun coverage we did abroad. And Bangkok by my former colleague Ana G. Kalaw, who covered the fashion and beauty beat in Manila for my newspaper Philippine Star and Cosmo PH, and now for The Magazine of Bangkok Post. Suddenly, a long layover doesn’t sound so hellish at all. Anthony Legaspi holding a king crab in a local seafood restaurant in HK. And Tim Ho Wan at IFC, which is “the most inexpensive Michelin-star restaurant in the world” with the best dim sum and pork buns in town. To get some high-intensity experience in a city like Hong Kong, five hours is impossible for it to be a memorable trip to the former British colony. But let’s try, shall we? So how do you take advantage of a long layover and make good use of this time to experience a bustling city? 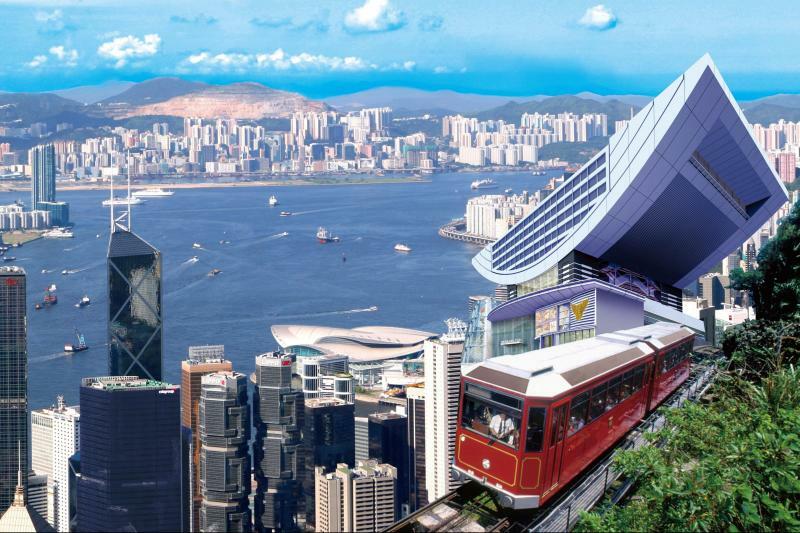 Take the airport express to get you to the city in 24 minutes — the ride gives you a glimpse of Tung Chung and for about 15 seconds it enables you to get an idea of where HK’s Big Buddha is located — and if your eyes are quick enough, you may get a glimpse of the cable cars that transport thousands of tourists every day. Reaching Hong Kong station at the end of the train ride, stop for lunch one level up to Tim Ho Wan, the most inexpensive Michelin-star restaurant in the world, and indulge in baked barbecued buns and some of the best dim sum you will find in town. Every day, people queue up in this thirty-seat restaurant, which really deserves more than you pay for, for its excellent food and friendly service. While you eat to your heart’s content, the city provokes a lot of walking, so do walk and burn and burp that lunch by passing through the iconic IFC building — a busy office and shopping tower where the biggest brands are available for the self indulgent…but wait, by this time you may only have less than four hours. Crossing Victoria Harbour, which thousands of commuters do daily between the two islands, can still be done on a sampan or junk boat, or the modern Star Ferry; (right) the 800-meter-long series of escalators at Midlevels in Central. Photos from HKTB and wikipedia.com. Anthony: “If I am able to do only one thing in Hong Kong, I would go to her highest point, which is the Peak.” Photo from grayline.com. Walk towards the Midlevels escalators. This 800-meter-long journey brings you to the famous Hollywood Road, a place that was built 100 years ago. Also known as Cat St., you can find here small gift items or maybe even a piece of furniture from some Chinese dynasty that will complete your living room. But hold your ancient horses, packing and sending furniture or vases will take away the 180 minutes you have left, so better just have a cold beer in one of the cool places in Soho, which is just right around the corner. Give yourself some 30 minutes for people watching before you head back to HK Station and look for the Exchange Square exit. Take bus No. 15 to bring you to the glorious views of Hong Kong known as Victoria Peak. 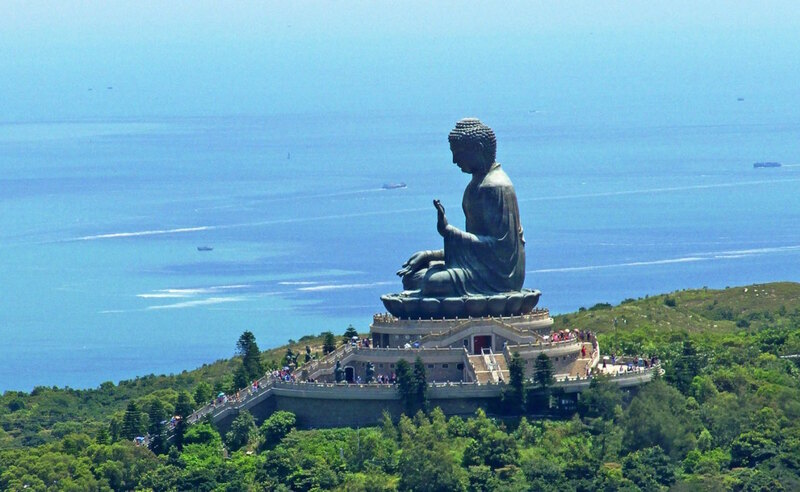 If I am only able to do only one thing in Hong Kong, I would go to her highest point, which is the Peak. It’s quite a sight — this stretch of twinkling skyscrapers and Victoria Harbour and, yes, the greenest hills found in the New Territories. It’s best to see it at dusk though. The queue can be long to take the Peak Tram but the ride to reach the top is a great experience! 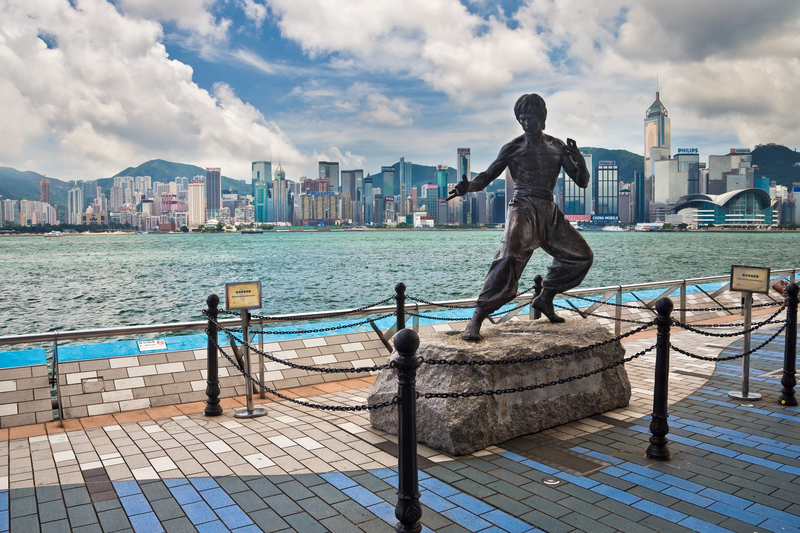 Enter the dragon with Bruce Lee, who still lords it over Hong Kong, particularly the promenade in Kowloon. Photo by Benson Kua/wikimedia.org. Once you are grounded again, find the nearest MTR to bring you to Tsim Sha Tsui. You still need to see the Avenue of the Stars and the promenade, and see Hong Kong at its business best: a topographical and architectural happening on HK Island standing high over the waters of the harbor. Yes, of course it’s the same area as HK Cultural Centre, Space Museum and Museum of Art if you are into that — but you have got only one hour left! Rush your way towards the Star Ferry to Island side to bring you back to IFC — yes, that same place where you started so you can take the Airport Express back. But sit by the window on the ferry and feel the breeze as you enjoy the magnificent views. Remember to take the opportunity to buy a Bo Lo Pao before you head back to the airport — this is HK’s best delicacy and make sure they insert for you a slice of nice, cold butter. Eaten best when your hands are dirty. Singapore’s Gardens by the Bay features the Marina Bay Sands Hotel with its three towers connected by a ship-inspired top with its glass-bottom swimming pool overlooking the city skyline. At left are solar-powered 18 man-made gardens called Super Trees. Photo from wallconvert.com. 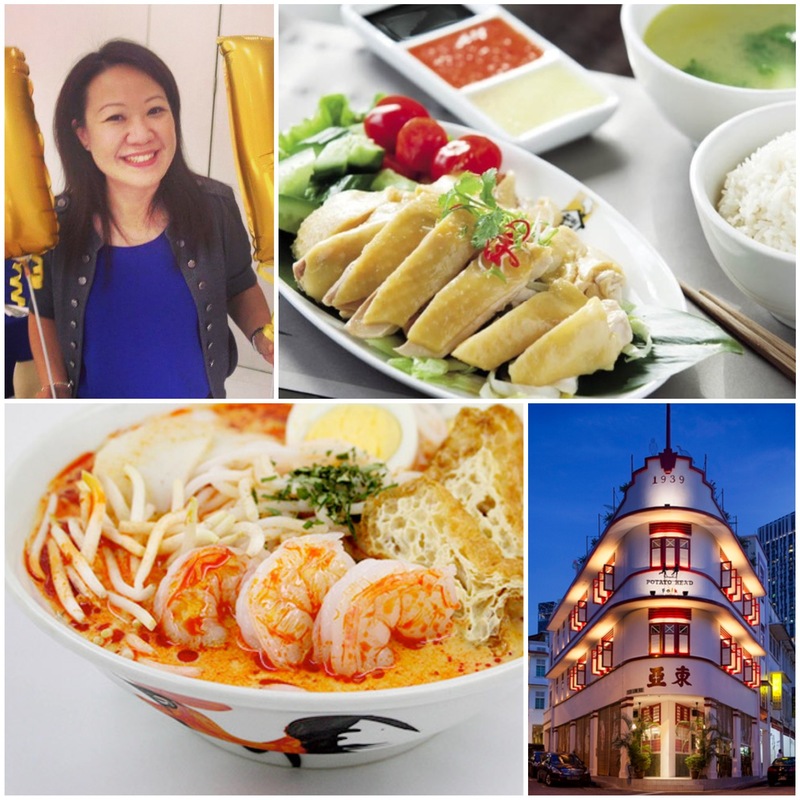 Sheryl Lim; Singapore’s unofficial national dish Hainanese Chicken; Potato Head in a re-purposed building in Chinatown; and another local fave, laksa, a spicy noodle dish with seafood and tofu. Photos from dishmap.com, yoursingapore.com, and luxesocietyasia.com. 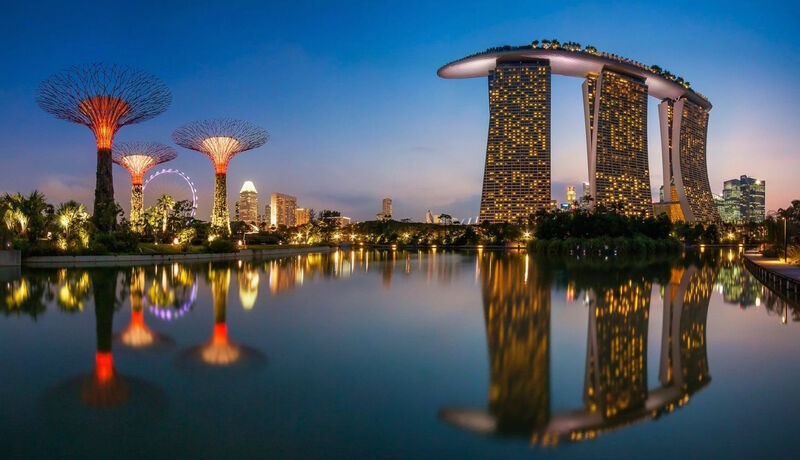 By Asian city standards, Singapore is small, so five hours can give you a glimpse and taste of the city-state without having to rush everything. Singapore is one of the world’s most modern cities, and yet interspersed among towers are heritage buildings, parks, and hawker’s centers not far from pricey restaurants. Keong Saik Road. Once a prominent red light district peppered with brothels back in the 1960s, Keong Saik Road now is peppered with some of Singapore’s coolest places. 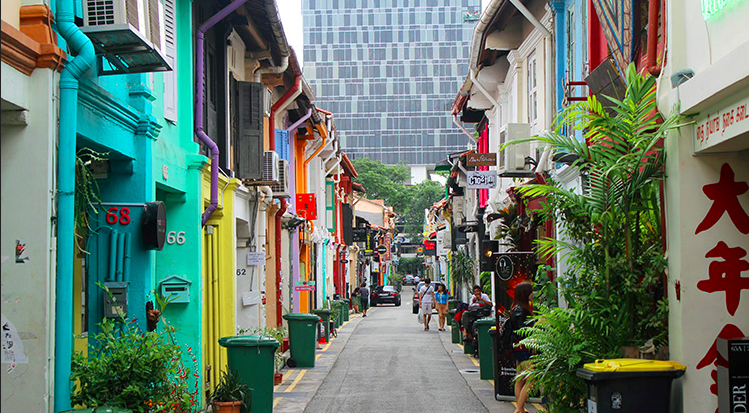 With a string of restaurants, bars and shops, you have to drop by at least once when you come to Singapore. LeVel 33. Located on the 33rd level of Marina Bay Financial Center (MBFC) Tower 1, it is the world’s highest urban craft-brewery. It is an innovative concept that provides an unparalleled dining experience complete with one of the best views of Singapore’s Marina Bay and city skyline. Singapore is so good at re-purposing heritage buildings into usable shops and restaurants, such as these old shop houses. Photo from lifestylelaundry.com. Haji Lane. In this row of pre-war shop houses, which was once an empty street, you will now find quaint boutiques set up by local designers and young entrepreneurs presenting fashionable wear and products showing made-in-Singapore designs. There will also be excellent vintage shops selling an array of contemporary, quirky garments and accessories. Singapore Botanical Gardens. An urban oasis, the sprawling Botanic Gardens, Singapore’s first UNESCO Heritage Site, provides great respite from the hustle and bustle of the city. Within the garden, you can also visit the newly launched SBG Heritage Museum, which features interactive and multimedia exhibits and panels that illustrate the Garden’s rich heritage. The National Orchid Garden, lauded as the world’s largest orchid display, features over 60,000 plants and orchids. 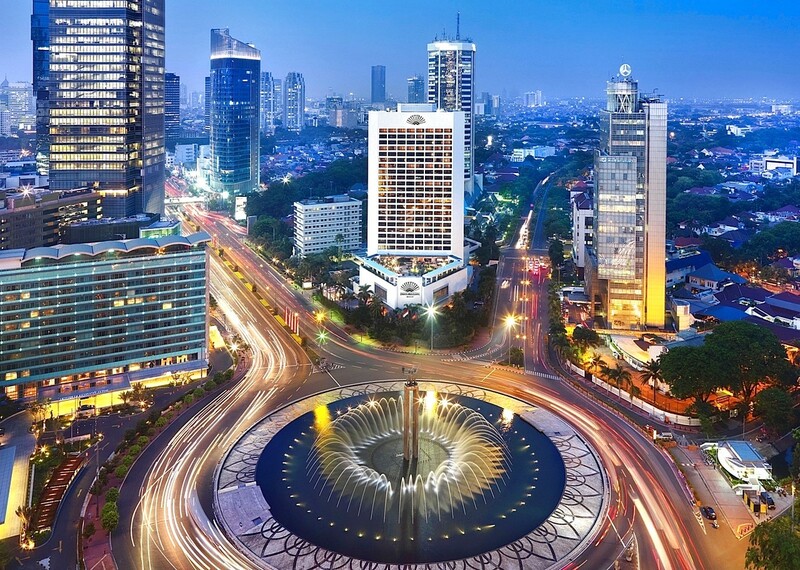 The capital and most populous city of Indonesia, Jakarta is comprised of several districts that offer a dizzying array of shopping centers, night spots, museums, historical buildings, and sightseeing. 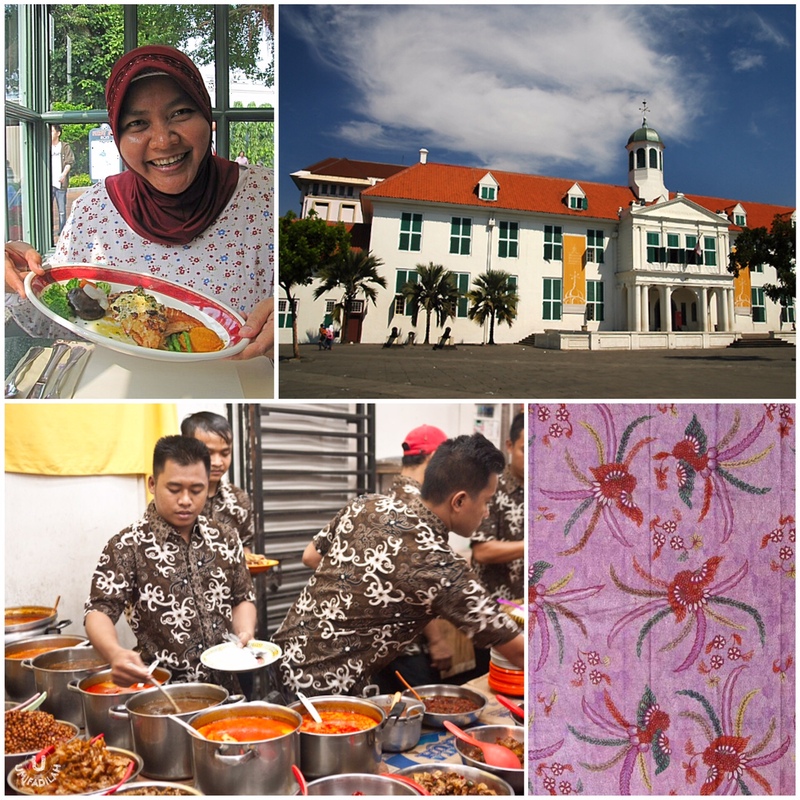 Yani Handayani; the train station from the Dutch colonial period; popular souvenir batik fabric; and a street eatery offering local dishes and delicacies. Photos from wikipedia.com and umiyam.com. Jakarta has lots of interesting places to see in five hours. You can spend all of them in the Old Town area where you can enjoy the iconic Fatahillah Museum (originally Batavia’s City Hall during the Dutch colonial period). There are lots of museums nearby: Wayang Museum, Bank Mandiri Museum and you can see the Dutch architecture of BEOS railway station. You can also go shopping at the nearby Mangga Dua area. If you prefer to spend most of your time shopping for local and foreign brands, then go to the Grand Indonesia Shopping Malls, the biggest malls in Jakarta. Don’t miss the dancing water fountain inside. Or walk to nearby Sarinah to buy gifts like leather or wooden puppets or batik clothes. You can also walk or take a bajaj (motorized pedicab) to Jakarta’s iconic Monas (National Monument), located in between the City Hall and the Merdeka Palace. Facing the Monas is the National Museum or famously known as Museum Gajah because there’s a small elephant statue in the front yard. To fully explore the museum takes more than five hours because there are lots of collections to see. So save this for a longer stay in Jakarta. The must-eat Indonesian food is nasi uduk, which you can find in most Indonesian restaurants. It’s rice cooked with coconut milk and served with side dishes like fried chicken or fried beef fillet. Kuala Lumpur’s twin skyscrapers Petronas Towers were the world’s tallest buildings from 1998 to 2004. 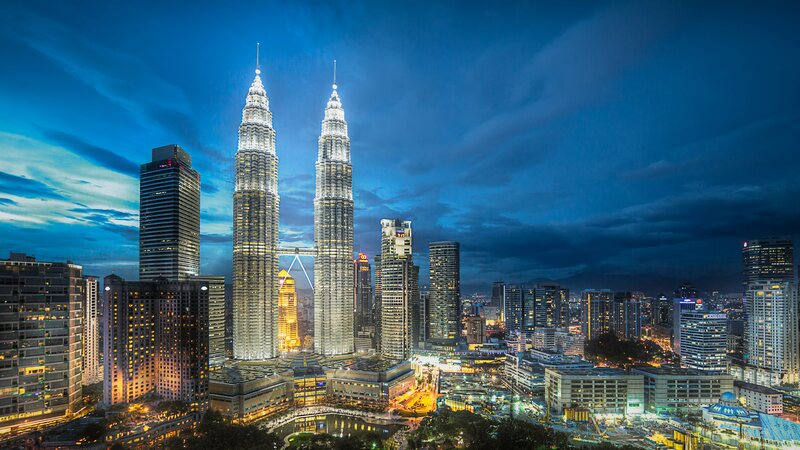 Designed by Argentine architect Cesar Pelli, they are also one (or two) of the most recognizable towers in the world. Photo from alphacoders.com. 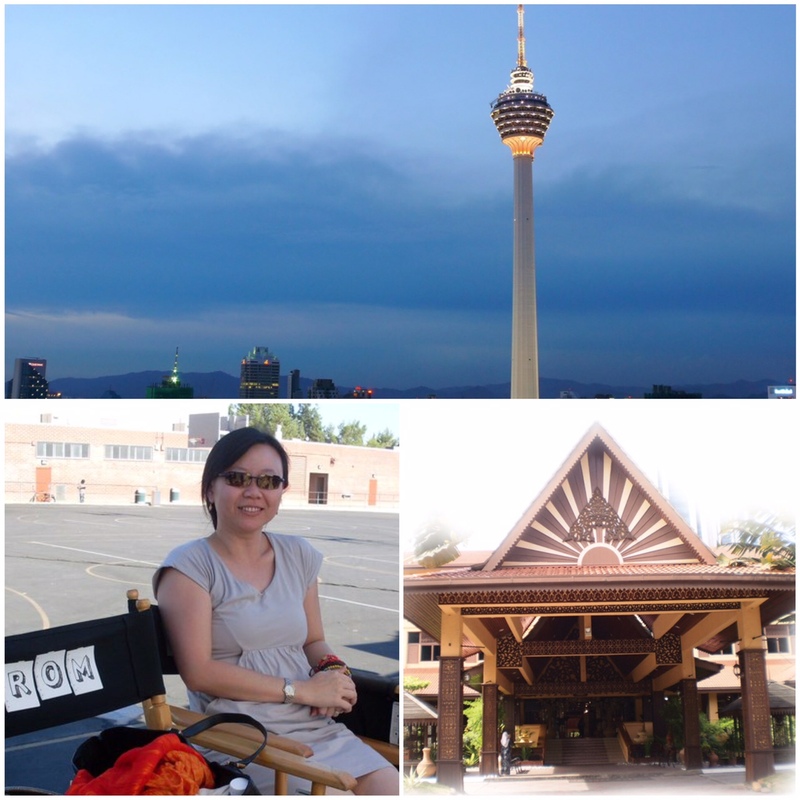 Vicky Ooi; KL Tower with its observatory deck and a restaurant at the top; and KL City Gallery. Photos from deelementshotel.com and kraftangan.gov.my. KL City Gallery: Jalan Raja (in front of Merdeka Square). Set in a century-old heritage building, the gallery has all things art and artistic as well as information about KL. It is also home to the Spectacular City Model, an architectural summary of the city and its story. KL Tower: Jalan P. Ramlee. Take a ride up to the observation deck, at 276-meter of this 420-meter-high tower. It’s the tallest in Southeast Asia and currently ranks the 7th tallest structure in the world. Nobu KL: Level 56, Menara 3 Petronas, Persiaran KLCC. If you happen to be here close to meal time, why not try to get a table at this famous international restaurant chain? It also has a panoramic view of the capital city and perhaps you may even see Malaysian glitterati dining next to you. KL (Petronas) Twin Towers & KLCC Park: Kuala Lumpur City Centre. Work off the meal with a stroll around the park adjoining Suria KLCC mall. Here’s the chance to snap plenty of pretty pictures with the dancing fountains and the twin towers as backdrop. Karangkraf Complex: Jalan Conlay. You will need to spend about an hour here to discover every type of handicraft from all 13 states of Malaysia. It also houses a crafts museum and demonstrations by craftsmen. And of course, plenty of handmade souvenirs for you to buy. 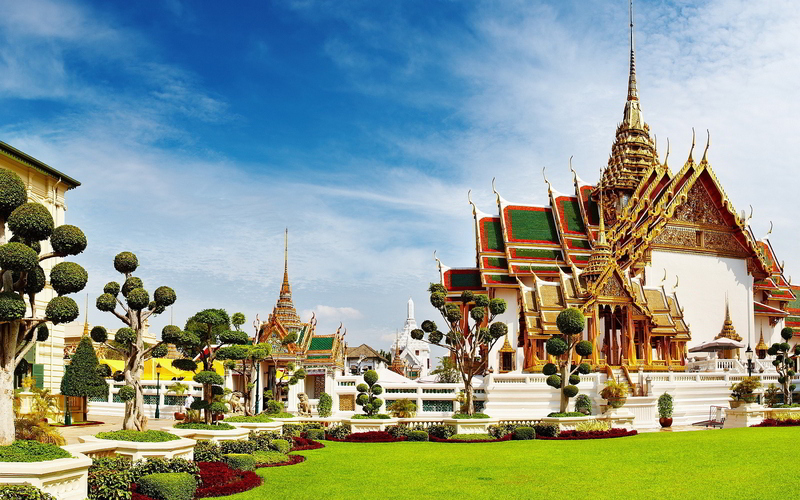 Bangkok’s Grand Palace has been the official residence of the Kings of Siam (Thailand) since 1782. It is a complex of buildings, halls and pavilions set in gardens and courtyards. Photo from rahlat.com. 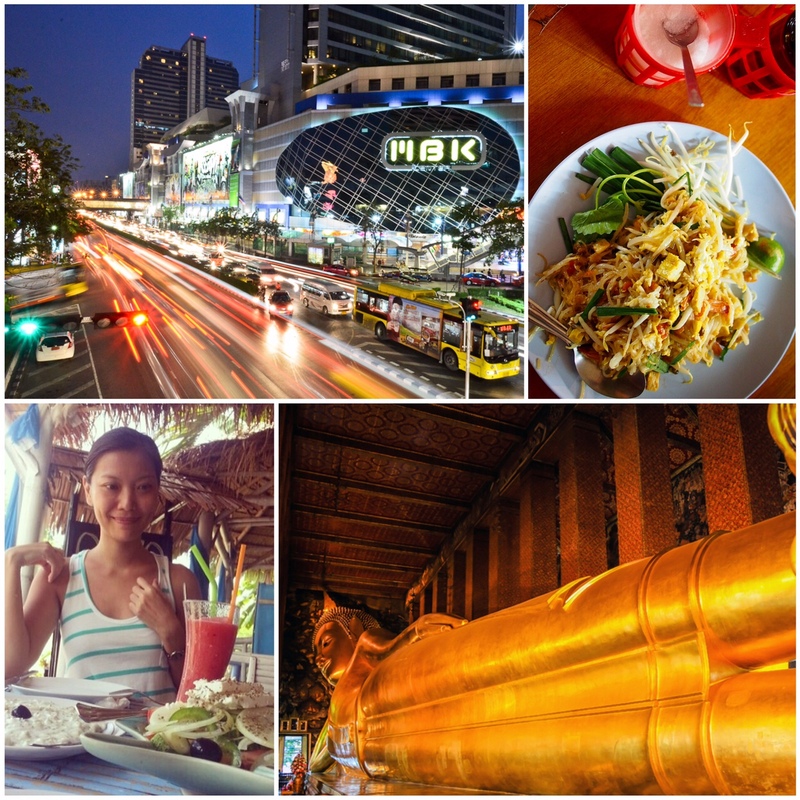 Ana G. Kalaw; MBK shopping center, a tiangge on eight floors with 2,000 shops; street food from Sukhumvit Soi 38; and the Reclining Buddha. Photos from everplaces.com, parenthetical.pilgrim/flickr.com, and earthxplorer.com. Five hours is not enough time in Bangkok. The traffic from the airport to the city and back alone will already take up half of the time. Thankfully, Bangkok has a decent sky train system that links the airport to the city. What goes down in these five hours all depends on what you feel like doing. Option 1: Those who want to take in a bit of history and culture can take the Airport Link to the Phaya Thai station and from there, take a taxi to Wat Po or the Temple of the Reclining Buddha, an iconic site that features a 46-meter-long Buddha covered in gold leaf. The compound it is situated in is very serene and peaceful, and houses pocket gardens, many golden stupas (hemispherical structures that typically contain “relics” or the remains of monks) and other Buddhist icons. Wat Pho is a 10-minute walk to the Temple of the Emerald Buddha (Wat Phra Kaew) and the adjoining Grand Palace. 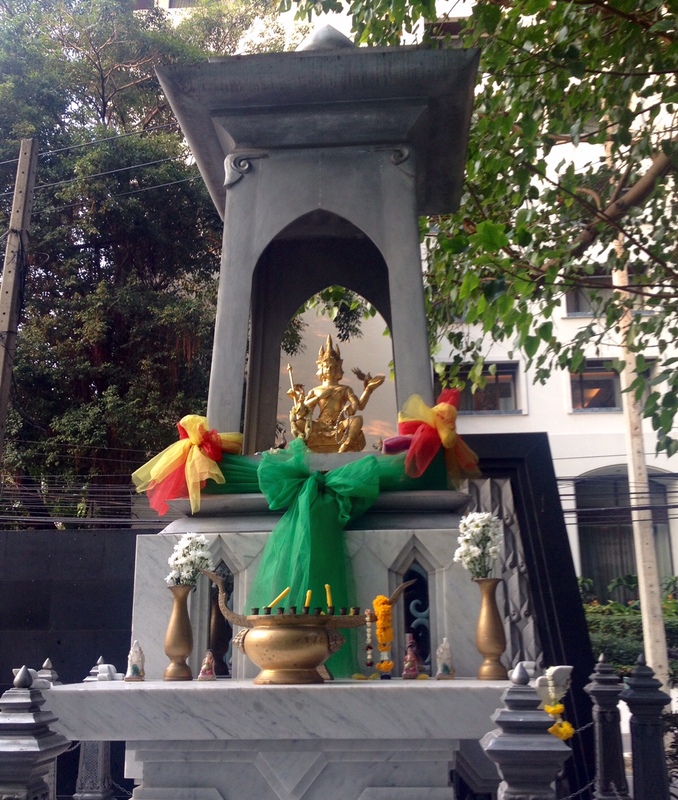 The Emerald Buddha is another landmark relic that’s about 26 inches high and, despite its name, is made of green jade. It’s a pretty sight but can be missed if you’re the type who thinks one temple sighting is one too many. The Grand Palace is a marvel to behold and is interesting, but makes for a rather impractical visit on a really tight schedule. (Chinese tourists by busloads mean cramming into narrow corridors and two hours of foot traffic). Instead, opt to stay at Wat Pho complex and get a traditional Thai massage. Wat Pho is considered the leading school of massage in Thailand and the treatments they offer here, though simple and technique-focused (no lavender-scented lobbies, fancy massage beds or New Age music), are probably the best you can get in Thailand. 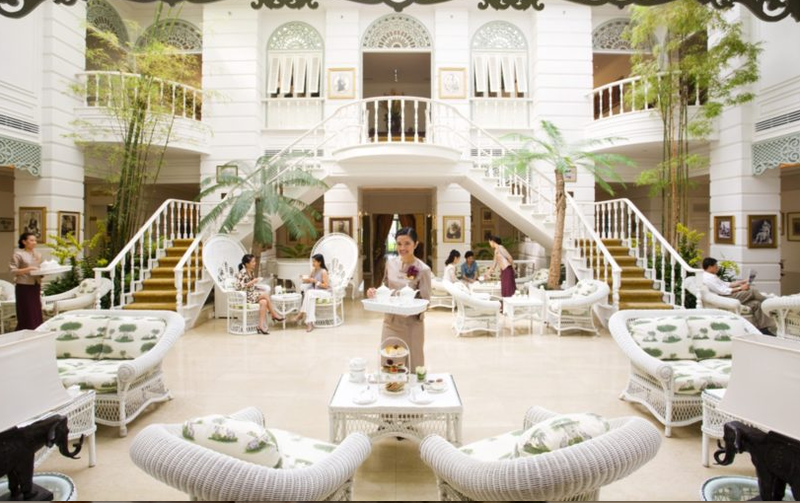 Mandarin Oriental Bangkok’s Author’s Lounge is famous for its high tea and the writers that have stayed there, including Somerset Maugham and Joseph Conrad. Photo from mandarinoriental.com. From Wat Pho, hie over to the nearby Tha Tien pier and take the public ferry down the Chao Phraya river in the direction of the Sathorn pier. Consider getting a quick drink, some snacks or afternoon tea in one of the five-star hotels located along the river. The Shangri-La and the Peninsula both have pretty and breezy riverside terraces from where you can enjoy a drink while taking in the Chao Phraya’s interesting sights (get off Sathorn Pier at and walk a few meters to Shangri-La or take the hotel boat to get to the Peninsula). The Mandarin Oriental (get off at the Oriental pier) offers afternoon tea at its iconic Author’s Lounge, a light-filled space named for the literary greats (Joseph Conrad, John Le Carre and Somerset Maugham included) who have signed into the hotel’s guest register. The Oriental offers two types of afternoon teas: a classic set and a Thai set. Go for the latter if you want to take in English teas with pandan-flavored scones, curry puffs and rice cakes. 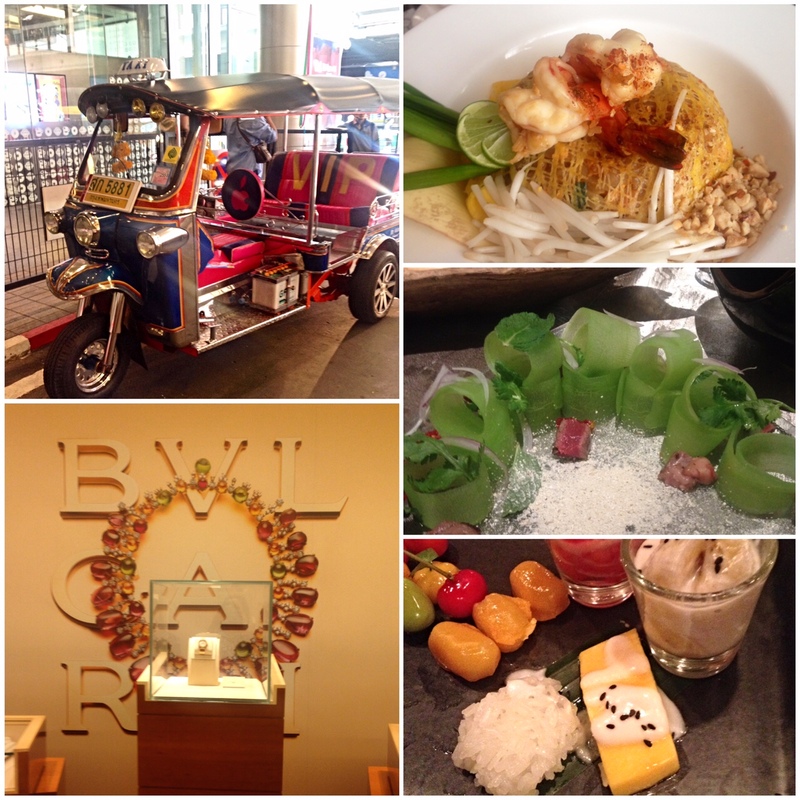 Tuktuk outside Siam Paragon mall; pad thai at St. Regis Hotel; cucumber and seared tuna at Kempinski; sticky rice and mango at Four Seasons; high-end stores such as Bulgari at Paragon. Photos by Tanya Lara. Consider making the trek back to the airport after your Chao Phraya visit. Take the BTS back to the Phaya Thai station and then make a switch onto the Airport Link to go back to Suvarnabhumi Airport. 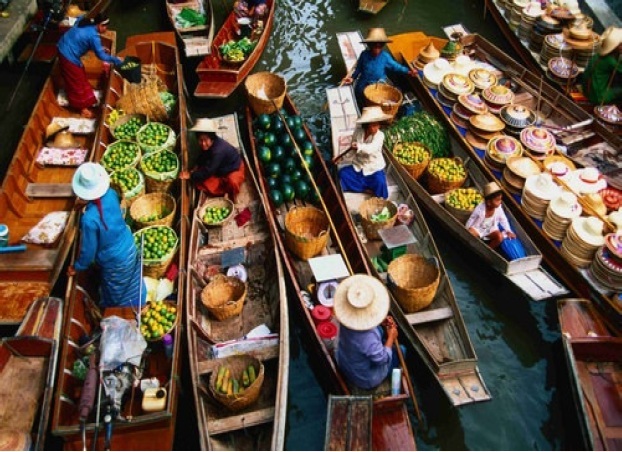 Option 2: Shopping lovers and the food-obsessed can use up their five hours hunting down fashionable finds and sumptuous eats in central Bangkok. From the Airport Link, get off at the Phaya Thai station and take the BTS skytrain to Siam, the city’s main commercial drag. Siam Station gives you access to the luxurious Paragon mall, Siam Center, home of diffusion lines and Thai designer labels, and Siam Square, a haven for funky finds and cute fashions. A five-minute trek will lead you to MBK, Bangkok’s version of Greenhills. Here you can find fashion “overruns,” startup labels, souvenir stalls and everything that has anything to do with mobile gadgets. Food is a huge part of Thai culture. The basement level of Siam Paragon is a maze of ready-cooked food, breads, fast food chains and stalls offering Thai food staples such as duck noodles, som tam, basil-topped stir fries and tom yum soup. Siam Square and the little streets and alleys surrounding it also have great affordable Thai and international restaurants. Get a reprieve from all that shopping by getting a foot massage in one of the spas surrounding the Siam area. A favorite is Chang’s right across Paragon. The chairs are comfy, and therapists experienced. You can also take the Airport Link to the Makkasan station and from there take the underground or the MRT to Sukhumvit station, which will take you to the Asok area and Terminal 21, an airport and travel-inspired shopping mall complete with boarding gate entrances and city-inspired floors (a miniature Golden Gate bridge on one level, and red double-decker buses on another). One BTS stop (Phrom Pong) will take you to EmQuartier, Bangkok’s hottest retail haunt right now. EmQuartier houses the biggest foreign brands, has a fashion zone containing the best Thai talent, and has three floors boasting some of the best restaurants in town. EmQuartier’s food court is always great for picking up quick but tasty eats while its supermarket has great souvenir options. 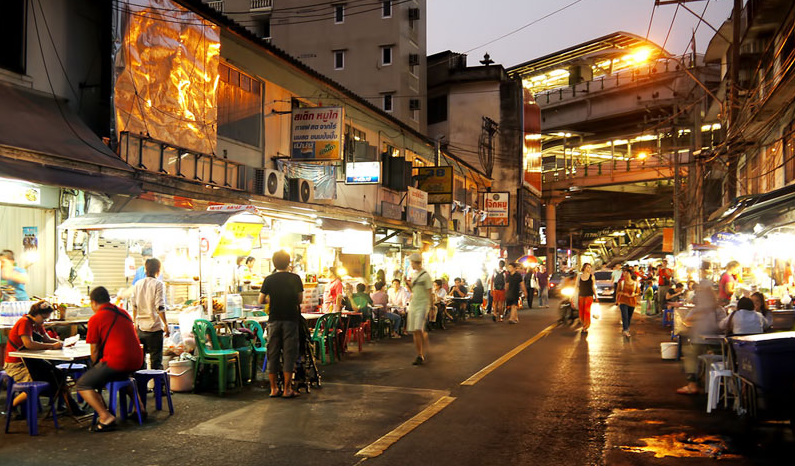 Sukhumvit Soi 38 is filled with beloved local eateries. Ana says, “But you have to hurry. Local reports say they will soon be taken down to make way for yet another condo-retail development.” Photo from bangkok.com. If your five-hour stopover falls in the evening, grab the chance to indulge in some street food at Sukhumvit Soi 38 (BTS Thonglor). This street is famous for having some of the best duck noodles, mango sticky rice, pad thai and khaosoi (rice noodles in curry soup). But you have to hurry. Local reports say that the street stalls and pocket restaurants will soon be taken down to make way for yet another condo-retail development. What a great collection of ideas for layovers. i have been on a few really long flights with long layovers. Those layovers allowed me to visit Switzerland, England, Kenya, and even South Africa. wow… amazing stopover! I did that too 4 years ago. Visited HK, Thai, Malay, Singapore, Jakarta! Exhausted! If I ever had to endure a 5 hour layover, I wish it would be in Singapore. So many new and exciting things to see, to experience and to photograph! These are great cities to visit and what a great way to spend layovers. The most tiring travel I ever did was to travel to and from Japan in one day. I left Manila in the morning and got the last flight from Narita to head back to Manila again. Wow! That highest point in Hong Kong might make me a little queasy! What is that building that looks so weird in that picture behind that trolly!? oh wow I want to go to all these places and make use of the 5 hours in each, thanks for sharing. All these authors are so awesome. I have always hated stop over cities, but if my itinerary included one of these stops I would be pretty happy! Thanks for highlighting some great destinations. I’ve never been to Asia, well, I’ve never left North America to be honest, but the culture has always been very interesting. I’d love to visit sometime and see the sights – it looks just beautiful! What a great post highlighting so many things to do on a 5 hour stopover! I love my experiences in Asia, but there seems to be so much down time in between! Great ideas! Thanks! 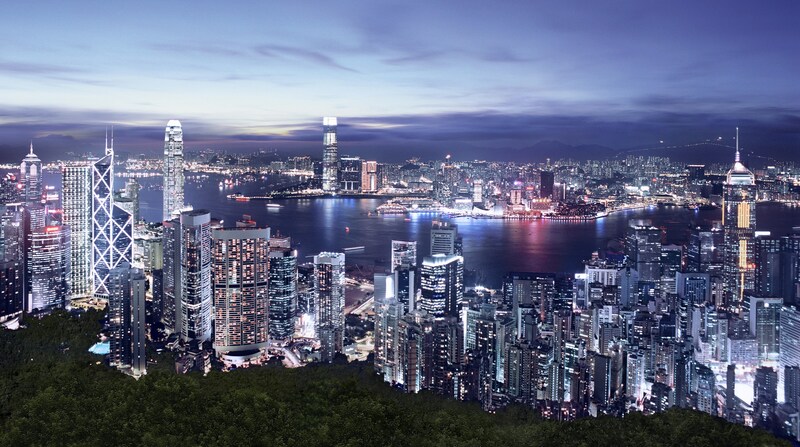 The Hong Kong skyline is a spectacular sight to see – simply gorgeous. The photo with the statue of Bruce Lee is too cool! Wow, these places are all so gorgeous! I would love a layover in Hong Kong to see some of those sites. And Singapore looks amazing too. I like this stopover series! It will keep you from being bored during long stopovers. Thanks for coming up with this. Wow, it looks so amazing there! I would give anything to visit there. I need to do more international travel soon, for sure. HK is easy to explore on a long stopover because of the airport express. 🙂 I’d love to go back to Jakarta!